About two weeks before Christmas, I tried to talk myself out of making any handmade presents. I conceded by making my in-laws some patchwork dish towels and hexagon coasters (but forgot to take a picture!). A week later, I finally admitted to myself that I just had to make something for the kids. The compromise that I made with myself was that I didn't have to make something for the baby because he's too young to remember it and I was running out of time. Gregory really loved it and especially loves that it glows. 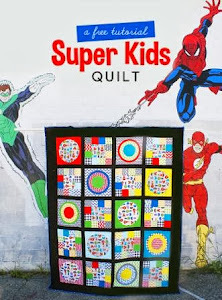 We've been talking about me making a full Sugar Skull quilt soon- but let me tell you- making quilts for your kids increases in difficulty as your children start voicing their opinions- opinions that are strong and do not budge. He's really intent on me using this darn panel I've had for ages and nixed my idea of doing a colorful bright solids version of the quilt.......... to be continued! I can't wait to share what I made for Charlotte, but I will save that post for the next Scraptastic link-up (I won a prize this month and I'm motivated to continue my participation with that fun blog activity!). I was spoiled by my husband in crafty goodness for Christmas gifts. I've wanted Blueberry Park fabrics for ages and the warm palette bundle is simply perfection. I've also wanted Mostly Manor and my husband snatched some up during a FQS flash sale when the bundles were 50% off. I'm going to undo the pretty bundles and sort the pieces into color order into my stash tonight. I also scored a yard each of Tiger Lily ballerinas on white and some older Christmas Anne Kelle. Every Christmas, I tend to get lucky and receive some awesome crafty additions to my sewing related library. I've checked out Handmade Style at least four times from my library and even made a quilt from a pattern therein, so I am very happy to finally have my own copy. 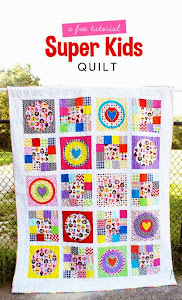 I heard Amy Gibson speak at our guild in the fall and was dying for her "Quilt Block Cookbook." I was able to see many of her quilts from the book in person and they're simply gorgeous. Finally, the "By the Bundle" book is one that I like every pattern within the book- I seriously want to make them all! Thanks for reading. I hope you are enjoying this holiday season and finding some time to be creative.